BANGI, 15 Nov 2013 – Malaysian civil law should be based on Islamic law and not on Common Law, the English set of laws derived from judgment of cases. 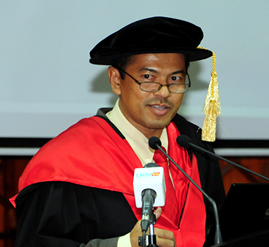 A professor from the Faculty of Islamic Studies at The National University of Malaysia (UKM) said today that there was a provision that allows the Malaysian legal system to use English common law to fill gaps in legal circumstances. However Prof Abdul Basir Mohamadin his Inaugural Lecture on “Islamic Tort Law an Exploration,” said tort law was now ready for the shift to Islamic tort law. Tort is branch of civil law which involves claims for damages. Tort covers a wide spectrum of claims for compensation and court order. If a neighbour’s house, for example, is blocking sun light to a person’s house, the house owner have grounds to sue the neighbour under tort law. A more familiar case would be defamation cases which was now gaining popularity. Prof Basir questioned why should Malaysia still be using the west as referral point when Islamic common law is complete and more just? Besides it is also not something that is foreign to the community since it had been used in the past. There was also now a lot of sources of law for Islamic civil cases, accumulated throughout the years either from the Arab countries or locally. “We need to revert to a law which is guided by revelation,” Prof Basir said. The Islamic civil law is also compatible with existing laws in terms of dispensing justice. So there is no reason why we need to refer to cases that were decided in England, a different society that have different sets of beliefs and way of life which are clearly incompatible with Malaysians. Though there are enough sources of law that can be compiled into a law enacted by parliament, he suggested a more realistic approach that can be implemented immediately without the hassle of drafting a law and debate in parliament before it can be passed. In the initial stages judges should play a role by referring to Islamic common law instead of English common law when giving judgements. Though this approach will not give Islamic law the credit but what is important is the essence, which is justice guided by revelation. If this can be practiced by the judges, with time Islamic common law will replace the English Law, which is not a statute enacted in Parliament. Prof Basir is a prolific writer who has published a number of books such as Tort Law a Comparison, Islamic Law of Tort and Malaysian Tort Law. Deputy Vice Chancellor (Academic and International Affairs), Prof Datuk Dr Noor Azlan Ghazali, deans, lecturers and students attended the lecture.